It has been just over four weeks since the Environmental Appeal Board (EAB) announced its decision to uphold South Island Aggregate’s (SIA’s) permit, which would allow the company to dump 5 million tonnes of contaminated soil at its rock quarry in the Shawnigan Lake watershed. Over the last four weeks, we have become a unified, galvanized, and mobilized community. Here are a few recent developments. On Thursday, April 16th, Calvin Cook, Steve Housser, David Robertson, Dr Bill Moulaison, Rod MacIntosh and I met with Minster of Environment Mary Polak. Also in the meeting by phone was Jennifer Mcguire, the Executive Director of Regional Operations for BC Ministry of Environment. The most important outcome of this meeting is the agreement by Ms McGuire to do an environmental assessment of the SIA site, and to coordinate any site visits with CVRD. Minister Polak acknowledged that there has been a significant volume of letters coming in expressing concern and outrage over this decision – your letters are making a difference! On Saturday, April 18th, MLA for Oak Bay-Gordon Head Andrew Weaver published an article he has written about this issue. Andrew had hiked through the CVRD land adjacent to the SIA site, collected water samples from run-off coming off SIA property into Shawnigan Creek, and took photographs of the debris in the fill that has been dumped onto CVRD property. 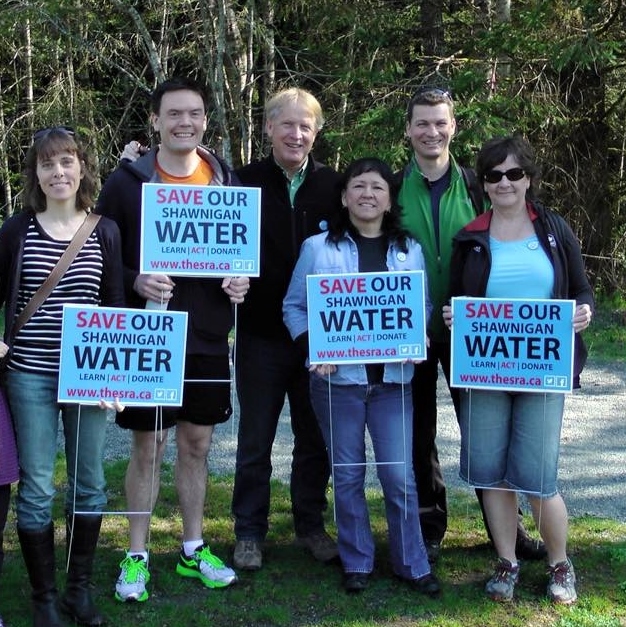 His excellent article is available here: http://www.andrewweavermla.ca/2015/04/18/shawnigan-watershed/ Please read and share widely on your social networks. On Sunday, April 19th, the Shawnigan community once again came together to make a clear statement about the importance of a healthy environment. Well over a hundred people gathered at the Kinsol Trestle for a Blue Dot event. It was a beautiful morning for a walk or run, and another wonderful gathering of the Shawnigan community. A huge thanks to Sierra and Alex Acton for organizing this terrific event. The Shawnigan Residents Association (SRA) volunteers are working tirelessly on a number of fronts. The SRA will be launching a judicial appeal of the EAB’s decision, funded by donations from the community. Please make donations through the SRA website or at the Watershed Office in Shawnigan Village. SRA has also initiated a petition asking the provincial cabinet to rescind the permit – the petition is available online at http://thesra.ca and in a variety of locations in Shawnigan and beyond. A huge thank you to all of the SRA volunteers, who are truly heroic in their efforts to raise the profile of this issue, educate people, and advocate for the protection of drinking water. Thanks also to Sylvia Gray, whose efforts have resulted in an official file on this matter being opened with the Office of the Ombudsperson. Sylvia has conveyed with force and clarity the many serious concerns that we have with the way in which this process has unfolded. Momentum continues to build, and the outrage at this decision is moving far beyond Shawnigan’s borders. We must keep up the pressure by continuing to write letters to members of the provincial cabinet, and sending letters to newspapers on Vancouver Island and on the mainland. Keep up the amazing work, Shawnigan. Your efforts are helping to ensure that our future does NOT included a contaminated dump in our drinking watershed.